State Budget Fights - March 1 Edition : It's All Politics Wisconsin protesters won a victory when a county judge said they had the right, at least for now, to statehouse access. GOP state officials have been trying to tamp down the protests by restricting access. 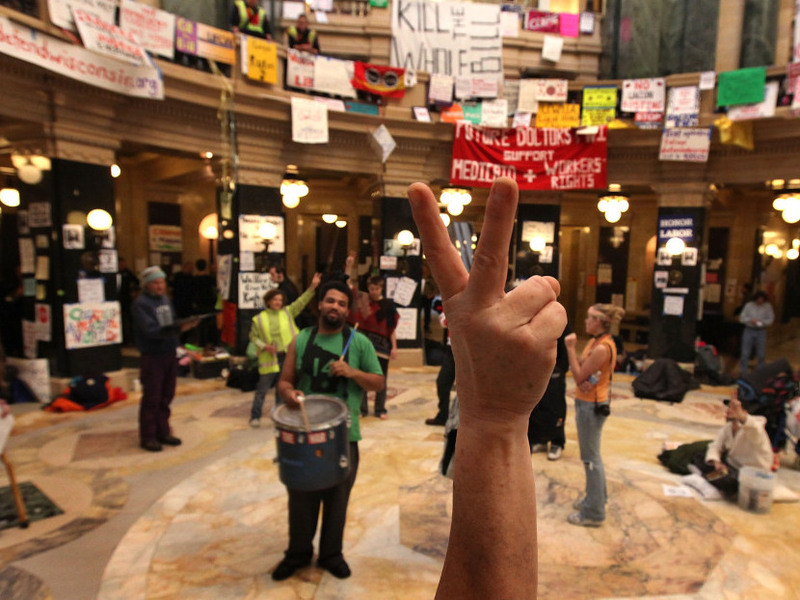 Wisconsin protesters continue to demonstrate in the state capitol's rotunda, March 1, 2011. It's day 15 of the governor versus unions standoff in the place Wisconsinites know as Mad City, their state's capital. Republicans who control the state government continued Tuesday to try and raise the flame under Democratic lawmakers and pro-union protesters. Republican officials have tried to dampen the marathon protests by closing the statehouse in Madison, Wis. to new protesters and making it less comfortable for those who remain. For their part, the protesters took the state to court to stop state officials from decimating their protests. They received at least an initial victory when a Dane County judge issued an injunction against the state officials' attempt to greatly restrict who can enter the statehouse. Meanwhile, Republican lawmakers are trying to turn the screws on the 14 Democratic senators who fled Wisconsin for Illinois in order to slow GOP-backed legislation that would limit the collective bargaining rights of public-employee union. That legislation is part of a so-called budget-repair bill that was supposed to be passed before lawmakers moved on to consider the actual budget legislation. The Republican senate majority leader, Scott Fitzgerald, is moving to take control over the pay of the staff members who work for the Democratic senators, according to the Milwaukee Journal Sentinel. Also on Tuesday, Gov. Scott Walker was to deliver his budget proposal to a joint session of the state legislature, sans the senate Democrats, Tuesday. In Ohio, what's being described by the Columbus Dispatch as the largest crowd of protesters yet turned out Tuesday to rally against GOP-backed legislation there that would reduce public-employee union rights in that state. Firefighters, teachers, nurses, labor unions and others arrived this morning for the demonstration. By 10 a.m., they were chanting, waving signs and showing their opposition to the bill. The rally is expected to continue until 6 p.m.
A vote on a bill to weaken collective-bargaining rights in Ohio is likely later in the week in the state senate. In Indiana, the other flashpoint in the multistate fight between Republican policymakers on one side and unions and their Democratic supporters on the other, Democrats from the Indiana House remained out of state like their Wisconsin counterparts. The highlight Monday, at least on the pro-union side, was the appearance of actor Danny Glover who spoke to a large crowd of protesters, the Indianapolis Star reported.